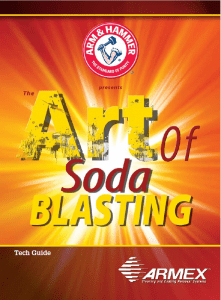 Baking Soda Abrasive | Gonneville Inc. While all baking soda is chemically the same (NAHCO3) only ARMEX is formulated for use as a blast media and only ARMEX is manufactured by ARM & HAMMER®. Formulations contain uniform particle sizes from 70-270 microns, and ingredients for flowability and rinsabilty. The profile formulas are uniquely blended for more aggressive removal applications. It’s Sharp – baking soda crystals delivered under relatively low pressure but at high velocity will scour virtually any coating from any substrate. It’s a Natural Deodorizer – which brings both acidic and basic odor molecules into a neutral, more odor-free state. Particularly effective on smoke and ash odors, typically strong odors at the high end of the pH scale. What makes ARMEX the Best? Greater Application Versatility – Formulated products to meet specific surface preparation needs, made from 3 uniform granulation sizes: 70, 170 and 270 microns. Superior Flowability – Using combined flow and moisture control ingredients, ARMEX is 2 to 8 times more resistant to moisture than other sodium bicarbonate abrasives. Enhanced Rinseability – Our patented formulas allow for removal of all residues, paint chips and other soils from the surface improving new coatings adhesion. Enhanced Cleaning Capability – Even grease, oil, burned on carbon deposits or scale can be removed using ARMEX premium formula HydroFlex or one of 3 Profile Medias. 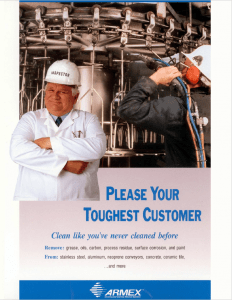 Total Technical Support – from the makers of Arm and Hammer products, leaders in environmentally responsible cleaning technology. 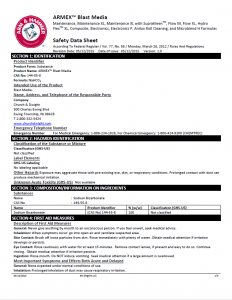 ISO 9002 Certification – the mark of consistent quality. Not All Sodium Bicarbonates are the Same. ARMEX Sodium Bicarbonate comes in different granule sizes ranging from 70 to 270 microns. 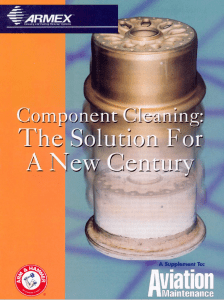 the micron size will determine the degree of aggressiveness of cleaning – with 270 microns providing the highest/extreme level of cleaning and 70 microns for more light/delicate cleaning. 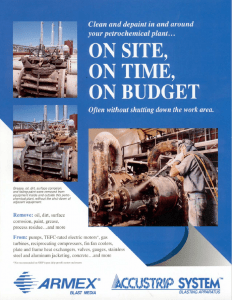 An additional benefit of ARMEX products are flow aids and advance moisture control additives which prevents vapor blast equipment from clogging. Sodium Bicarbonate is a natural desiccant and loves to absorb water. 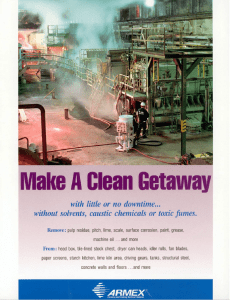 Without these flow aids and advanced additives, traditional Sodium Bicarbonate would clog vapor blast equipment. In addition, these additives helps to preserve ARMEX when stored in high moisture environments. Vapor Blasting uses a smaller quantity of water than conventional water blasting. ARMEX can be used in Vapor Abrasive equipment with no modifications to the equipment. 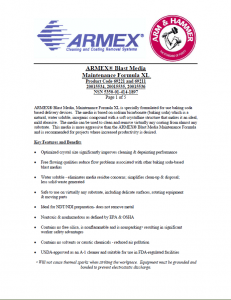 This allows Vapor Blasters to take advantage of ARMEX’s abrasive cleaning benefit of substrate preservation. ARMEX is introduced into the Vapor Blast pressure vessel in the same manner as other medias. The change in process from a hard abrasive media to ARMEX is the need to use a slightly larger differential pressure to achieve the desired flow rate from the equipment. 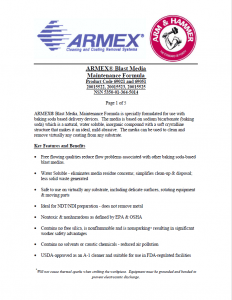 This is not a a surprise as ARMEX is lighter in density than most other abrasives used in Vapor Blasters. Vapor Blasters also eliminates most of the dust previously created when dry blasting with baking soda and consumes less media making Vapor Blasting the most effective and efficient way to use ARMEX.